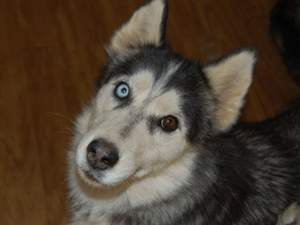 Annie is an adorable 6 year old Siberian that came in with a group of Huskies and Husky puppies that the owner could no longer properly care for. This shy little girl had no clue what was happening to her and she was curious, but skittish and very, very frightened. Annie soon realized that we were her friends and started to relax. At first, she was cautious and would slowly come up to you and look at you with those beautiful bi-eyes (one brown/one blue). Patience was rewarded and she soon allowed us to softly pet her. Annie has settled into her foster home and it is thrilling to see her transformation into a happy pup. She now demands attention and loves to join you on the couch ~ this girl is making up for lost time! When she is not outside playing with the other dogs, she is nearby enjoying your company. She is now play bowing and dancing for her dinner. Annie is a winner ~ she came to us as a little “Orphan Annie” and with some TLC and trust, she has emerged as a happy, social Siberian full of love and happiness. We are so very proud of her! This girl has a lot of stored up love and is going to make someone a fabulous and dedicated companion. She is now ready to find her forever home and leave us with many paw prints on our hearts.